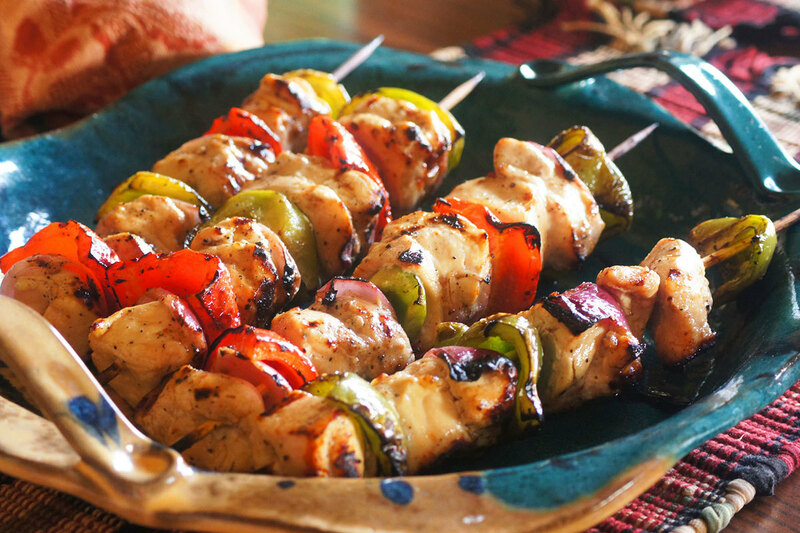 Substitute your favorite low-fat protein for the chicken or try a new potato variety for a vegetarian version of this delicious kabob! Recipe courtesy of Produce for Better Health Foundation, www.MoreMatters.org. Heat oil in a small saucepan until very hot. Remove from heat and stir in garlic. Let cool. Once cooled, stir in herbs, salt, lemon juice and pepper. Set aside. Place potatoes in a medium-sized microwave-safe bowl and cover with lid or plastic wrap. Microwave on high for 10 to 12 minutes or until potatoes are tender. When potatoes are cool enough to handle, cut into large chunks. Thread potatoes, chicken and vegetables onto skewers. Grill over medium-high heat for about 10 minutes, turning frequently and brushing with a little of the herb mixture during the last few minutes of cooking. Remove from grill and place on platter. Drizzle with remaining herb mixture. Serve.